Deluxe Digipak of special board with booksleeve and 24 page booklet of special paper. It has been seven long years since MAYHEM released their fourth and latest full-length ‘Ordo ad Chao’. Rejuvenated by the recruitment of Teloch (of NIDINGR fame) in replacement of iconic guitarist / composer Blasphemer who left the fold in 2008, the spearhead of Black Metal is back stronger than ever before with a new album. ‘Esoteric Warfare’ demonstrates how perfectly Teloch has captured the essence and spirit of the Norwegian legend by linking the band back to its roots, while at the same time taking a step forward into the leading position of the genre instead of dwelling in nostalgia. ‘Esoteric Warfare’ is a full-scale assault of total dark savagery, where Attila's inhumane vocals are entirely based on a concept dealing with the esoteric experimentations of the nuclear powers during the cold war. 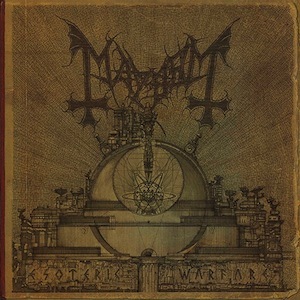 The album proves once again and beyond doubt that MAYHEM are the Alpha and the Omega of black metal!